Scoutmaster Barry Deutsch honored for life saving good deed. I can not say with certainty that my friend Mr. Barry Deutsch actually saved a man's life but I can tell you that Barry routinely goes beyond call of duty serving his community as a leader with Boy Scout Troop 477 where he has taught leadership & service to hundreds of young men within our community. Barry and his wife Councilwoman Lynn Deutsch took it upon themselves to search for the missing man and Barry acting on a hunch, climbed down a deep ravine where he found the man injured by the fall seven hours previously. 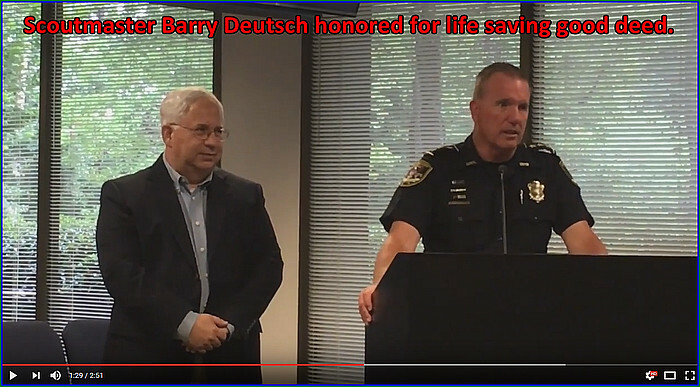 Though the Dunwoody Police Department and the Boy Scouts of America honored Mr. Deutsch for this specific act, in my book Mr. Barry Deutsch is an everyday hero who unselfishly gives of his time and talents to make this a better community. Thank you Barry for saving this man's life and thank you for all you do in our community!! PS: Lynn - you rock too! Georgia Power addresses numerous power outages in the Dunwoody North Subdivision. 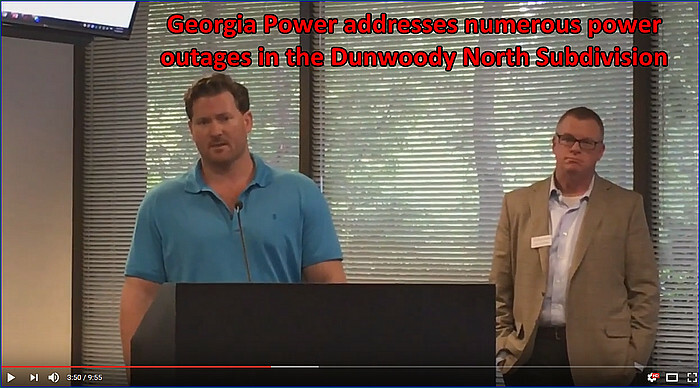 Georgia Power representatives explain the circumstances of power outages and the improvements coming to the system to reduce the number incidents in the future. Rep Karen Handel addresses Dunwoody City Council & announces town hall opportunity. 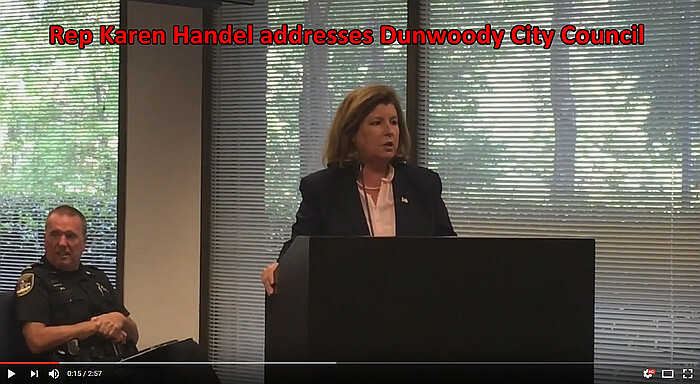 Congresswoman Karen Handel stopped by the Dunwoody City Council for a very brief introduction on Monday evening where she set the tone of cooperation, she introduced her staff, offered constitute services & announced her committee assignments (Judiciary & Education). There was no question or answer session available at the meeting but there is an oppertunity to raise issues with the Congresswoman on Wednesday as per the information below as found on her website. Roswell, GA -- Congresswoman Karen Handel announces that she will hold her first town hall meeting on Wednesday, August 30, at 7 pm EST. During this 60-minute teleconference, Congresswoman Handel will give a brief update on her first months representing Georgia's 6th District and answer questions from her constituents. "It is an incredible honor to represent the citizens of the 6th District, and I look forward to their input and questions," said Congresswoman Handel. Participants must be residents of the 6th Congressional District and complete the form at https://tthm.wufoo.com/forms/rep-karen-handel-telephone-town-hall-signup/ for instructions to participate. Karen Handel was sworn in as the 6th District representative on June 26th, becoming Georgia's first Republican woman ever elected to the United States Congress. Handel serves on the Judiciary and the Education and Workforce Committees. Representing East Cobb, North Fulton, and parts of DeKalb Counties. Karen and her husband Steve live in Roswell. Update From The Honorable Karen Handel. Update from Georgia Power. (Jeff Petrea). Presentation of Convention & Visitors Bureau of Dunwoody 2nd Quarter Financial Statement Through June 20, 2017 and Projected Budget. Recognition of Barry Deutsch with Boy Scouts of America's Certificate of Merit. Disposition of Excess Property - Dunwoody Police Cars. Resolution Appointing a Member to Serve on the City of Dunwoody Alcohol License Review Board. Resolution Appointing a Member to Serve on the City of Dunwoody Design Review Advisory Committee. Resolution Appointing Community Members to Serve on the Hotel Motel Tax Advisory Committee for the City of Dunwoody. Resolution Appointing Members to Serve on the City Council Hotel Motel Tax Advisory Committee for the City of Dunwoody. Approval of SPLOST Project List and Related Debt Issuance Authorization for County Referendum Language. Parking is also available on a limited basis at the Dunwoody Park ballfields, nearby New Hope Church (located at 5477 Roberts Drive), and Austin Elementary School. Do you know someone who would be a great Dunwoody Police Officer - applications are now being accepted from a wider pool of applicants. The men and women of the Dunwoody Police Department are committed to providing excellent service to the citizens of Dunwoody. As an outward symbol of that commitment for 2016, Chief Grogan asked members of the department to provide #oneword that symbolized their individual commitment to our mission and to the people of Dunwoody. Since the Dunwoody Police Department started soon after incorporation, I can assure you that our hiring standards were very rigorous and we only accepted experianced applicants who were police officers in other jurisdictions who passed extensive background checks and had a spotless record. With the compitition escalating for quality police officers between various jurisdictions and the Department not being able to maintain a level of being fully staffed, it appears by looking at the most recent job announcement that the Department has stepped away from the requirement of needing to be P.O.S.T. certified (namely from another agency). I welcome this change as it opens oppertunities for quality individuals coming out of the military, professionals looking for a carreer change and it probabbly offers a wider diversity as well as more home grown officers who have deep ties to the community. The City of Dunwoody Police Department is currently accepting applications for certified and non-certified Police Officers. 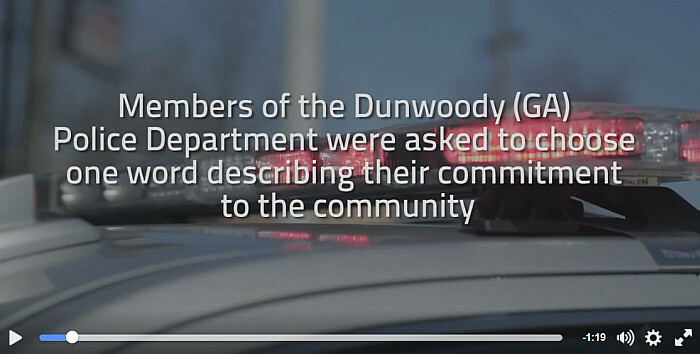 This is the first rank of the Dunwoody Police force that includes sworn peace officers. Sworn officers are expected to demonstrate competency in law enforcement procedures. Officers work under the general supervision of an assigned Sergeant. They perform a wide range of law enforcement functions including making arrests, issuing traffic tickets, crowd control and investigative work to promote public safety and security, crime prevention and general enforcement of the law. Proclamation Recognizing Dunwoody High School Principal Tom McFerrin. Presentation of Award from the Federal Highway Administration for Excellence in Planning. Recognition of Dunwoody Police Department Officer and Employee of the Second Quarter. YTD Financial Report for June 30, 2017. Resolution Establishing the City of Dunwoody Special Purpose Local Option Sales Tax (SPLOST) Priority List for proposed DeKalb County Sales Tax Increase to be voted in November. AJC Article - building consensus? Funding Authorization to Connect the Sidewalk and Bike Lanes on Chamblee Dunwoody Road to Donaldson Bannister Park. Assignment of Liability for the State Farm Project. Approval of Parks and Recreation Master Plan Concept Designs. Resolution Adopting Comprehensive Transportation Plan Update. Discuss funding for the Dunwoody Nature Center North Woods Pavilion. Discuss Hotel Tax Capital Budgeting Process. - no document in packet - historical. Painting With A Twist opens in the Georgetown Shopping Center this week in Dunwoody. 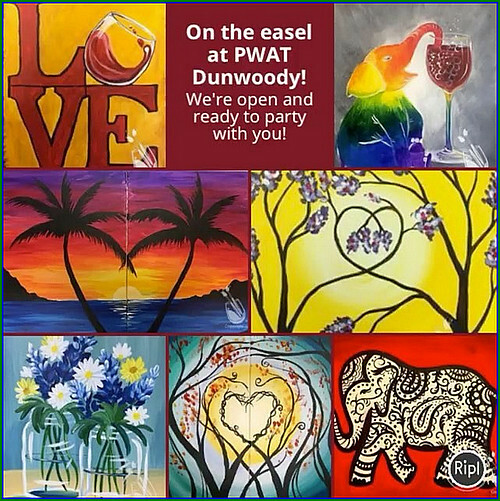 Painting With A Twist is a BYOB paint and sip art studio offering wine and art painting classes, located in Dunwoody, GA in the Georgetown Shopping Center, right off 285 at Chamblee Dunwoody Rd. Bring your favorite bottle of wine or other beverage, your favorite food & your favorite people and we'll take care of the rest. One of our talented artists will be with you every step of the wine and painting art class as you eat, drink and paint your way to a finished work of art. You'll be amazed before the night is over! You just might discover your inner artist! BYOB. Wine & Beer only. No alcohol during All Age classes. BYOB classes: 18+ ONLY. No one under 18 permitted (including infants) - no exceptions. All Ages classes: All ages welcome! 1. Paving … Repaving the south bound lane of Chamblee Dunwoody Rd that was the subject of poor compaction around the installed new water line from Manjet Way to Cambridge is complete except for stripping. FYI, on asphalt paving it takes about 30 days for it to “cure” before you can paint strip the road. As you all know that project was on last years paving plan. Chamblee Dunwoody Rd from Cambridge south passed Vermack, etc. is on this years paving contract and is a different contractor and will he paved later this month … that is if it ever stops raining for a few days. As a FYI, you can’t pave a road in the rain, when the pavement is wet or when there is a threat of rain. Concerning the threat of rain … if you ever spray the road with the hot liquid asphalt - which is the adhesive for the asphalt topping - and it rains prior to getting the asphalt topping in place you will have a mess of large proportion. 2. More Paving … The paving on N Peachtree Rd is mostly complete. The paving on Ashford Dunwoody Rd is moving along slowly because of the weather. Over the last three weeks we have only be able to pave six nights due to rain. As you know we are doing this paving at night due to the high traffic volume on this road during the day. The paving is mostly complete from Perimeter Center East/West southbound and the milling and a lot of the deep patching is completed north bound to Mt Vernon Rd. We need about 6 - 7 more good weather days to finish this project. 3. Glass Recycling … As of JUL 17 DC is no longer accepting glass items in our recycle bins. As I understand it was a lack of economical marketability. As an alternative the DC Sanitation has put glass recycling bins around the County. Dunwoody has three locations for you to continue to deposit your glass recyclable items. These locations are … Brook Run Park, DC Fire Station # 12 on Roberts Dr and the Dunwoody Library. This approach will make the recyclable glass items a more marketable and positive cash flow resource for the recycler. For more information go to this website …. https://www.dekalbcountyga.gov/sanitation/glass-recycling. 4. Home Owners Association and Swim and Tennis Club Leadership Town Hall Meeting with the Mayor (thats me). … There will be two of these meetings. The first will take place on AUG 24 from 6 - 8 PM at the Congregation Ariel Synagogue located at 5227 Tilly Mill Rd and the second meeting will take place on SEP 30 from 9:30 - 11:30 AM at Dunwoody United Methodist Church at 1548 Mt Vernon Rd. Both of these meeting will be an open forum to discuss items of interest to our HOAs and Swim and Tennis Club leadership. If the head of the organization is unable to attend either session we ask they send their assistant or a representative. To sign up email Bob Mullen at Bob.Mullen@DunwoodyGa.gov. 5. Honored Guest at the Next Two City Council Meetings ... Next Monday, AUG 14 at 6 PM we will honor Principal Tom McFerrin of DHS with a Proclamation from the City. There are many adjectives to describe Tom … outstanding, superb leadership, etc. … just to name a few for the enhancement he has brought to DHS and thus our entire city. I know we will have a large crowd of thankful students, parents and other citizens present to show Tom our heartfelt thanks! He is a great American! On Monday AUG 28 at 6 PM we will have the honor of hosting The Honorable Karen Handel, our newly elected U S Representative from our 6th District, at our City Council meeting. Karen is a very personable person so lets all show up to give her a warm and respectful Dunwoody welcome. 6. City Boards and Committee Meeting … We have instituted a once a year meeting for all members on our City Boards and Committees to brief them on the latest procedures as well as rules and regulations that are applicable. The next meeting will be on AUG 24 at 6 PM at the City Hall in the City Council Chambers. If you didn’t make the first meeting I ask everyone to make max effort to attend this meeting. The meeting will last approx. 1 - 1.5 hours. 7. 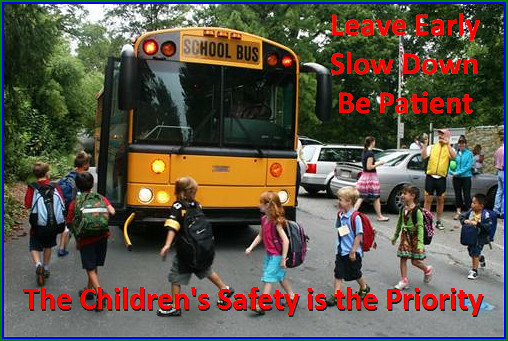 School is Back in Session … Please obey the speed limits and drive extra carefully … those are our children! 8. 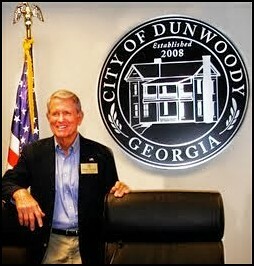 Request … We all move to Dunwoody because it is a special place. Lets help keep it that way by waiting to take our yard waste and trash out to the curb until the night before our trash pickup and by bringing our containers back off the street the night of our trash pick up … it is the neighborly thing to do! 9. New City Hall … Remodeling of our new city hall building is on schedule. 10. 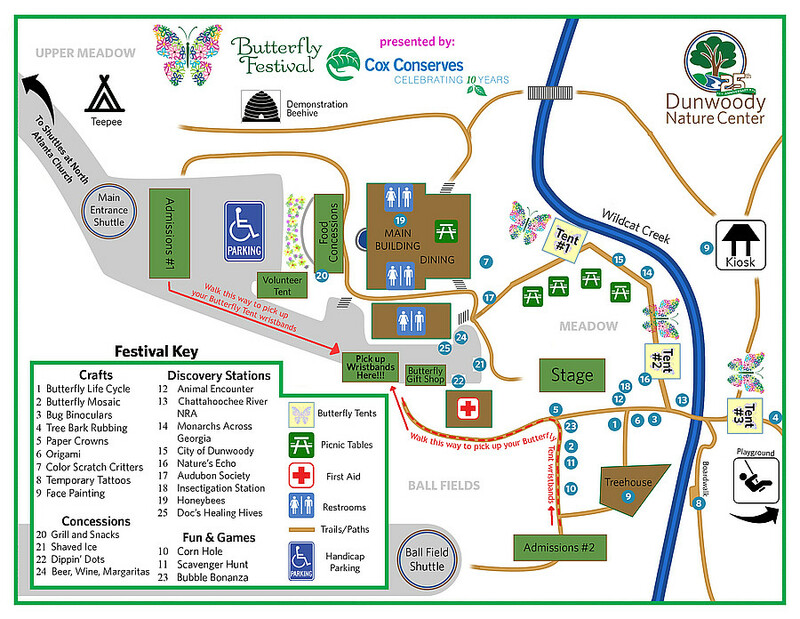 Other Events … Butterfly Festival at DNC AUG 19 from 10 AM - 4 PM. Advance sign up at … http://dunwoodynature.org/learn/annual-events/butterfly/. Warning this popular event sells out as it is fun for the whole family. Food Truck Thursday are on going at Brook Run Park starting at 5 PM every Thursday. 11. That is all for this evening. Please pass this on to your friends, neighbors and members of your HOA. If anyone wants to be added to my email list just let me know. Thanks for all each of you do to make us a city with a family atmosphere. Let us all work to create the mutual respect that we all desire! See you around town! Let Us Continue to Build Our City Together! Monday is the first day of school in Dunwoody so please excercise great patience for all involved. Monday is the first day of school for the DeKalb County School System, therefore for hundreds of Children this will be their first day of a new school and for their Parents, it will be a right of passage that will be documented with photos and maybe a tear. Please take it slow & easy on the roads this week and above all please be patient & kind for those experiencing this special first week of school. Elementary school starts about 7:30 so please don't be passing Chesnut on North Peachtree, Austin on Roberts or Dunwoody Elementary on Womack around this time unless you really have to! Peachtree Middle School starts about 8:30 so again stay away from North Peachtree around this time if you can help it. Dunwoody High starts at 8:00 am, so it is expected that Vermack and Womack will be a nightmare at 7:30. PS - If your Sophomore or Junior plans on driving, please have them explore parking at St. Lukes on Mt. Vernon by picking up an application in the office. I am guessing the Dunwoody Police will be out in force for the start of school, so please keep it slow and obey the traffic/parking regulations. Be alert for school speed zones and obey the posted speed limits. Be alert for children playing and gathering near bus stops, as well as those who may dart into the street without looking for traffic. When backing out of a driveway or leaving a garage, watch for children walking or riding a bicycle. Leave early enough to not be passing an elementary school near the starting time of 7:30 / 7:45; the students need to be there then - you do not. Be a good role model. Always buckle up in the car, always wear a helmet when biking, and always follow pedestrian safety rules. DO NOT text or talk on the phone while driving. Supervise young children as they are walking to school, biking to school or as they wait at the school bus stop. Have your children wear bright clothing so motorists can easily see them. Make sure your child is properly buckled up in a weight-appropriate child safety seat in the back seat. Make sure that your teenage driver understands and obeys all state traffic laws. Allow lots of extra time the first several weeks of school as everyone is learning a new routine. 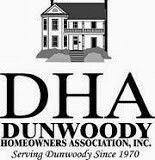 Dunwoody Homeowners Association meeting Sunday night to discuss proposed developments. Sunday, August 6, 2017 @ 7:30 P.M.
DeKalb County School District sends Leadership Survey to Dunwoody High Parents to help find new principal. 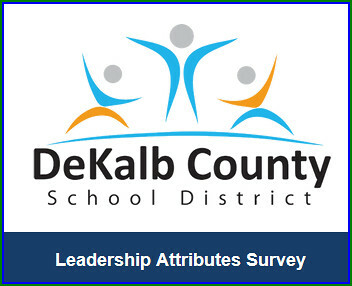 As a valued member in your local school community, the DeKalb County School District invites you to participate in a Leadership Attributes Survey for Dunwoody High School. We seek your input to assist us in making important decisions that affect our students and schools. Please respond to the web-based Leadership Attributes Survey in the link provided below. We sincerely value your input. The results of this survey will provide valuable information to school district leaders regarding the selection of leadership personnel for your school. Thank you in advance for your time and response to this survey. What are some challenges in your school/community that the leader will need to address? What focus should the school leader have that will improve operational efficiency? What strengths must a leader possess in order to be successful at your school? How should this leader build trust in the success of the school with stakeholders? In the next five years, where should the leader have taken the school? What improvements should be evident? What strategies should this leader use to prioritize student achievement and career readiness, and strengthen parental/guardian involvement? Dunwoody City Council election qualification opens Monday August 21st - three local seats up for election. 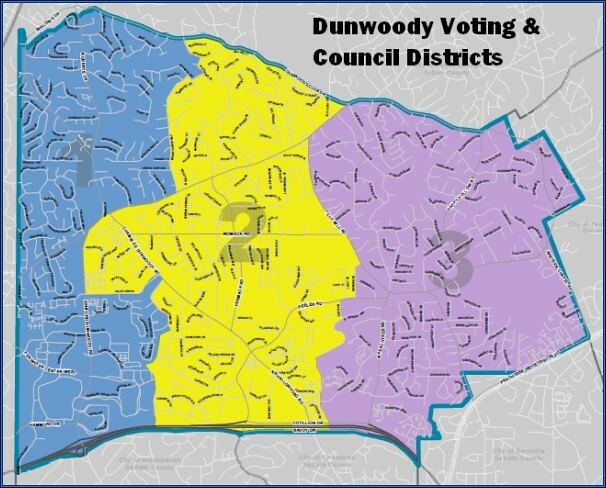 A General Election for the City Dunwoody will be held on Tuesday, November 7, 2017 for the purpose of electing three (3) members of City Council. A General Election for the City Dunwoody will be held on Tuesday, November 7, 2017 for the purpose of electing three (3) members of City Council. The City Council posts to be voted on are Post 1, currently held by Pam Tallmadge, Post 2, currently held by Jim Riticher, and Post 3, currently held by Doug Thompson. The qualifying period for the November 7, 2017 General Election will open at 8:30 am on Monday, August 21, 2017 and will close at 4:30 pm on Wednesday, August 23, 2017. The hours of qualifying each day will be 8:30 am to 4:30 pm, with one hour allowed for the lunch break (Georgia Election Code 21-2-132). Any person desiring to run for office shall qualify in the Office of the City Clerk by filing a Notice of Candidacy. The qualifying fee for the office of a City Council post is $360.00 (three hundred sixty dollars), which is 3% of the total gross salary of the preceding year (Georgia Election Code 21-2-131). All qualifying fees shall be paid at the time of qualifying (Georgia Election Code 21-2-131). 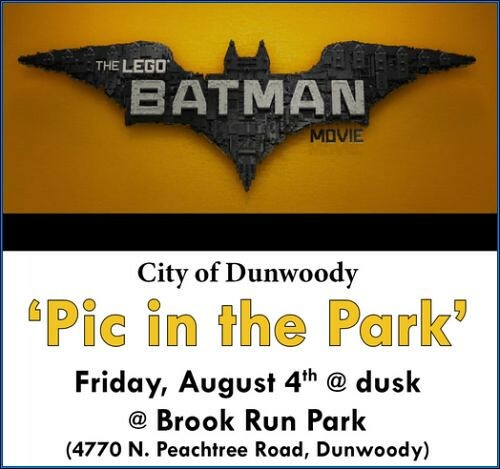 The City of Dunwoody’s ‘Pic in the Park’ event will feature The LEGO Batman Movie (PG 1h 44mins) and will take place Friday evening August 4th at dusk on the lawn beyond the playground at Brook Run Park (4770 N. Peachtree Road, Dunwoody). Bring the family, friends and neighbors along with a blanket or chair and relax under the stars and enjoy a FREE family friendly outdoor movie on a giant 45’ screen. The Popcorn Lady will serve popcorn from 8:00 p.m. - 10:00 p.m.
All movies are open to the public and begin at dusk. Feel free to bring your picnic baskets and coolers. Please mind local ordinances/rules regarding open containers and glassware. Dunwoody Girl Scout Troop 12576 donates clothing bin to assist Malachi’s Storehouse & families in need. Is it time to clean out the closets? Looking for a place to donate your gently used clothes? How about the new clothing donation bin at Malachi’s Storehouse? You can donate clothes 24/7, and all the clothes go to families in need. The bin is located in the front parking lot of St. Patrick’s Episcopal Church at 4755 North Peachtree Road, across the street from the entrance to Brook Run Park. The new clothing bin was donated from Junior Girl Scout Troop 12576 which includes girls from Chesnut Elementary and Kittredge Magnet School. After touring Malachi’s Storehouse a year earlier, the girls discovered that Malachi’s did not have a way to collect donated clothing. 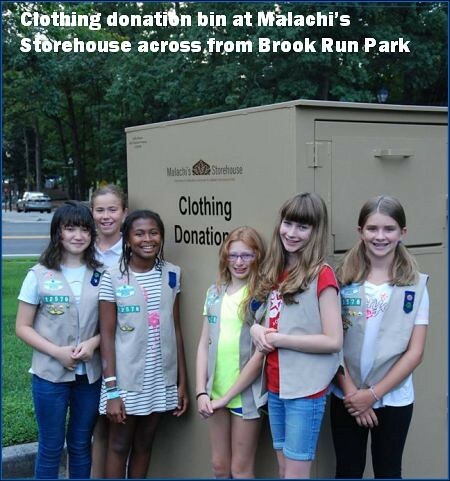 For their Bronze Award Project, Troop 12576 raised funds to purchase a clothing collection bin to put outside Malachi’s Storehouse. To raise the funds to purchase the bin, Troop 12576 had bake sales at The Mad Italian, Brook Run Park’s Food Truck Thursdays, Chesnut Elementary’s Bingo Night, and Kingswood United Methodist Church. Malachi’s Storehouse paid for the signage on the bin. The troop is very grateful for the community support. There will be a dedication ceremony on September 10th at 12:00 to celebrate the addition to Malachi’s Storehouse and the girls’ hard work on the project. WHO: Lekotek, a local non-profit that helps all children succeed and learn through play. Lekotek facilitates the inclusion of children with disabilities into their families and communities by being a “play library” loaning adapted toys, educational materials, computers and iPads. Computers and iPads are outfitted with appropriate software and applications to meet every child’s individual needs – whether the child has a visual or hearing impairment, autism, Down syndrome, cerebral palsy, genetic disorder or any special need. 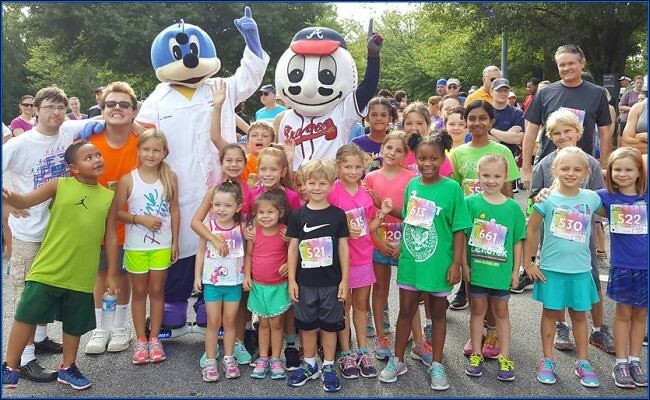 WHAT: The Lekotek Run 4 Kids is gearing up for its 25th year with a scenic four-mile loop run and a one-mile fun run to raise money for the non-profit so additional children can benefit from their play library and other resources offered by the non-profit. More than 700 children and families benefited from Lekotek’s play library last year. WHEN: Saturday, August 12 Four-mile race begins at 8:00 a.m. One-mile fun run at 9:00 a.m. *In addition to pre-race registration, runners can also sign up the morning of the event, beginning at 7:00 a.m.
WHY: This family-friendly race is well organized, runner friendly, with refreshments and family activities following the run. You don’t have to be an athlete to participate, just someone who wants to make a difference! REGISTER: Register online at lekotekga.org or call 404-633-3430.